Cold Fire® firefighting range can extinguish A, B, D & F type fires by safely removing intense heat on contact of any surface. Being 100% biodegradable, non-toxic, non-corrosive, makes Cold Fire® environmentally friendly and completely safe to use around humans and marine life. Cold Fire® unique plant based formulations considered to be 10 times more penetrable than water alone. This extraordinary characteristic enables Cold Fire® to penetrate a heated surface and/or fuel source 10 times faster than water. It works by not only removing the heat element of the combustion triangle thereby reducing the flashpoint, but simultaneously works to remove the fuel source which also prevents the possibility of reignition. 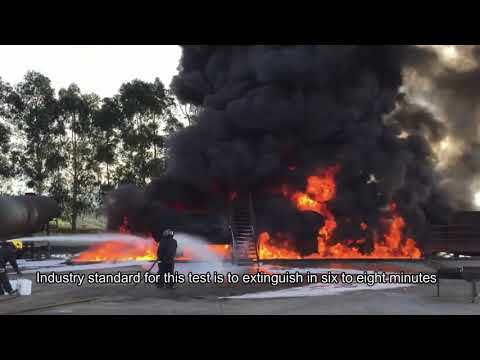 Unlike water or even air, Cold Fire® firefighting has an extraordinary penetration capability that literally allows it to be rapidly absorbed into a heated surface. It's this that destroys the molecular structure of heat on contact. This allows the heat to be instantaneously released and dispersed into the atmosphere at ambient temperature.